So you’ve decided you’d like indoor window shutters. Good choice. And you’re going to save a fortune by buying them ready-to-fit yourself. Smart move. Now you just need to find the right ones. Here’s where you can find out all about our shutter styles and follow our 3 simple steps to find the right material and the best shutters for your rooms and windows. Go for value with craftwood or MDF shutters, or choose natural style with classic hardwood or our sustainably sourced premium teak shutters. Vinyl has come a long way – you’ll be surprised how lovely this material looks and feels. 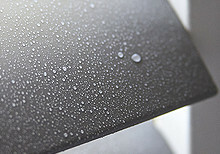 And it’s waterproof, so ideal for kitchens and bathrooms. 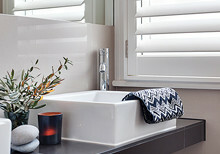 Indoor plantation shutters make a great addition to any and every room in the house. And they’re so much more than an elegant window covering. Shutters help you control the light, keep your room cool in summer and warm in winter, and add privacy, security and sound proofing – good news for people who love a good night's sleep. Living room, lounge, family room, it’s the heart of the home. 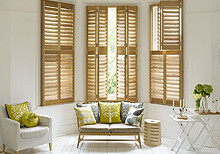 Shutters in the living room are great for style, light control and privacy. 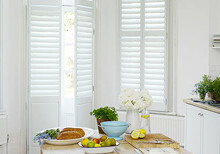 Shutters in the kitchen look great and are a really practical choice. They’re secure, easy to clean, and open up for a bright start to the day. Attic rooms and loft conversions are spaces where you need to make the most of the light. 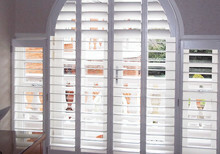 Cue shutters, custom made for any shape window.